Learn how to better locate, interpret, and apply sprinkler system requirements through 3 days of expert-led high-impact training. An online pre-course gives you the confidence you need to tackle more advanced learning in the classroom. 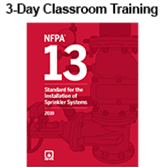 Examine fire sprinkler system protection strategies through this comprehensive classroom training program based on the completely reorganized 2019 edition of NFPA 13, Standard for the Installation of Sprinkler Systems. Through collaborative exercises and discussion led by industry experts, learn about new industry technologies, examine developing hazards and concerns, and get the fundamental knowledge required for both the design of new top-quality installations and the assessment of existing systems. Learn vital basics from a real-world case study. This revised NFPA 13 course will take participants through the design and analysis of a virtual manufacturing and warehousing facility where real-world decisions, standards use, and solutions will be investigated. You'll be more confident and efficient in your designs, installations, and analysis through interactive instruction that engages participants in the full range of NFPA 13 application. A Certificate of Educational Achievement is available after the course upon completion of an online review and exam. An online pre-course to help ensure you come prepared. Before the classroom training begins, an online pre-course imparts the base of knowledge you need to absorb more advanced learning. The 30-minute online pre-course provides an introduction to the organization of NFPA codes and standards, NFPA 13's development process, effective document navigation for effective use, official NFPA global definitions, NFPA 13's scope and application, and each chapter's organizational structure. *Go online to earn your Certificate of Educational Achievement! After attending classroom training, review key concepts online and take the online exam at your convenience using the web link provided. You can prepare for the test in your own time frame, using online tools for review. Passing the exam will earn your Certificate of Educational Achievement, confirming your course knowledge. See the Certificate FAQs Tab for more information on purpose, limitations of NFPA Certificates, and Course Objectives. Earn 21 hours or 2.1 Continuing Education Units. Attendance is required to earn CEUs. Please verify applicability with your professional board or organization before attending. Ask for the National Fire Protection Association (NFPA) Rate at either of these 4 local hotels: 1. Beantown Inn; 2. Candlewood Suites Boston; 3. Residence Inn Marriott Boston/Braintree; or 4. Embassy Suites Boston at Logan Airport. For more information click here. What is an NFPA Certificate of Educational Achievement? An NFPA "certificate of educational achievement" recognizes that an individual has successfully met the requisites of an NFPA certificate program, including attainment of the training program's learning objectives. It is issued after an individual has successfully completed the required training program and has obtained a passing score on an examination. The examination is based solely on the educational content of the classroom training and will take the form of an open book examination. Your certificate of educational achievement demonstrates that you have met the educational objectives of the NFPA training program you attended. It makes no claims as to your proficiency in conducting any specific task or job. NFPA certificate programs are based on established best practices in adult education. NFPA certificate programs go beyond NFPA's traditional classroom trainings by measuring your knowledge on the subject matter taught, and awarding certificates of educational achievement, which demonstrate that you have achieved the educational objectives of the training program you attended. Who should get an NFPA certificate of educational achievement? Professionals who are looking to document that they understand the core concepts found within the training program in which they have participated. What is the difference between a certificate of educational achievement and a professional certification? A "certificate of educational achievement" is awarded after the completion of an NFPA certificate program. It recognizes that an individual has successfully completed the requisites of a one-time educational course or training program. NFPA certificate programs are not what are generally known as professional certifications. Professional certifications are typically programs that certify professional or occupational competence and require certain prerequisites such as education, years of experience, successfully passing an examination, and ongoing eligibility requirements (such as retesting or participating in a minimum number of educational activities). While an NFPA certificate of educational achievement is a valuable recognition of educational achievement that can enhance your professional development, there is no professional or other credential associated with a certificate and certificate holders may not claim to be certified, licensed, accredited, or registered to engage in a specific occupation or profession. How do I know NFPA certificate programs are of a high quality? NFPA training follows established best practices in adult education, and conforms to the ANSI/IACET Standard for Continuing Education and Training. What type of examination is used? NFPA certificate programs use an online, open book examination as an assessment tool. The exam consists of multiple choice questions based on the content found within the program. Individuals must participate in 90% of the certificate program as required by ANSI/IACET 1-2007, and measured by attendance forms distributed during the program. Individuals must also receive a minimum passing grade on the examination at the conclusion of the training program. Individuals must also agree not to disclose the contents of the examination nor reproduce examination materials. What if I need an accommodation to take the examination? Participants with sensory, visual, orthopedic, or other disabilities that would prevent them from taking the examination under standard conditions may request special accommodations and considerations. You must submit a written request, at the time you register, that explains the disability (i.e., the diagnosis), the type of accommodation you feel is appropriate, and attach supporting documentation of the diagnosis from a qualified healthcare professional. For information on submitting a request for accommodation please call 508-895-8367. After receiving the request and appropriate documentation, NFPA will contact you to confirm the special accommodation arrangements. What if I don't pass the examination? The certificate program is designed to effectively convey the core knowledge needed to pass the examination, and most individuals with a reasonable amount of study and review will pass the examination. Individuals who do not pass the examination may elect to retake the examination for a $125 fee. Re-taking of the examination must be completed before NFPA discontinues the certificate program on the edition of the code or standard that the participant received training on. Do I have to renew my certificate of educational achievement? The certificate of educational achievement acknowledges an individual's attainment of the intended learning objectives from a specific certificate program. The information presented in the training is based on current knowledge and practice and/or on a specific code edition. Therefore, NFPA recommends remaining current with the latest codes and standards by periodically participating in appropriate NFPA certificate programs as your field and as code and standards evolve and update. What if I have a complaint regarding the outcome of my certificate program? NFPA endeavors to deal with any individual's complaint in a constructive and timely manner. Informal complaints, such as complaints made on evaluation forms, will be reviewed by the appropriate NFPA staff and any necessary action for improvement will be taken. Formal complaints may be submitted to the division manager of NFPA's professional development department in writing via email at custserv@nfpa.org, or by mail at NFPA, Fulfillment Center, 11 Tracy Drive, Avon, MA 02322. Formal complaints will be reviewed and responded to within 30 days. Does NFPA keep a record of the classroom trainings and certificate programs I've attended? Yes. NFPA maintains confidential and secured records of all participants' training as required by the International Association for Continuing Education and Training. These records are kept for seven years. If you ever need to document your past training, you may log in to your "My Training Page" on the NFPA website and view the educational products you have purchased. To have an official transcript sent to you, contact NFPA professional development in writing via e-mail, or by mail at NFPA, Fulfillment Center, 11 Tracy Drive, Avon, MA 02322.